Length of time depends upon our ideas. Size of space hangs upon our sentiments. A day will outlast the millennium. A tiny room is as the space between heaven and earth. Place is the product of lived space and lived time, a reflection of our states of mind and heart. In the original Chinese, the above poem ends with the character 間, which in Japanese is pronounced chiefly as ma. Originally, this character consisted of the pictorial sign for “moon” (月) — not the present-day “sun” (日) — under the sign for “gate” (門). For a Chinese or Japanese using language consciously, this ideogram, depicting a delicate moment of moonlight streaming through a chink in the entranceway, fully expresses the two simultaneous components of a sense of place: the objective, given aspect and the subjective, felt aspect. The translation of ma as “place” is my own. The dictionaries say “space,” but historically the notion of place precedes our contemporary idea of space as a measurable area. Architectural theorists accept this: “In [our] understanding of nature we…recognize the origin of the concept of space as a system of places.” My translation was selected in part to get away from the rendering of ma as “imaginary space” by Itoh Teiji; this deals only with the subjective aspect, without doing justice to the full spectrum of use and meaning which this venerable character represents. From the hundreds of uses of the character ma in traditional and modern Japanese, I have selected a few which I present here in order of increasing complexity of meaning. Here ma denotes a line in space, a measure of length or distance. From ancient times Japanese architecture was based on wooden post-and-beam construction. 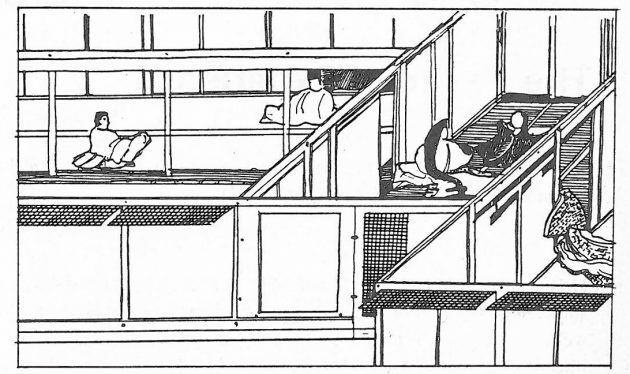 The distance between the centerlines of successive posts — the hashira-ma (橋ラマ) — evolved into the basic structural unit of the traditional Japanese wooden house. To signify this carpentry measure, the character is pronounced ken. (Over time and in different regions of the country the ken varied in length from about 10 to 6 feet). By the 16th century, all column sizes and timber dimensions were expressed as fractions or multiples of ken. The sizes of the rush mats which evolved into tatami were also originally derived from the ken. Ma combined with a number of tatami mats denotes area. For a Japanese, however, a reference to a room of a certain number of floor mats would also instantly call to mind a particular usage, interior makeup, decoration and height. Since the adoption of the tatami in Japanese residential architecture about 500 years ago, there have been two ways of expressing land area: the tsubo (坪), an area one ken square measured from the centerlines of the columns; and jo (帖), the area covered by one tatami. Neither is an exact measure. The tsubo does not respect the thickness of the walls, while tatami sizes vary from region to region. For modern construction, the square meter is always used. The first character in this word originally stood for a “hold in the ground,” and later took on its present meaning of a “hole in the universe” or “the sky.” Ono Susumu suggests that the ancient Japanese divided space vertically into two parts. One was sora (空 , sky), which was understood as absence of content, emptiness. The other was ame or ama ( 天, heaven), which was the opposite of kuni ( 国, region, realm, government) and thus meant an earthly area of habitation and rule. Thus ku-kan compounds two characters which are charged with independent meanings by long Chinese and Japanese cultural traditions including Buddhism. These traditional meanings soon influenced the compound, yielding a meaning different from the original intent, and causing some obvious confusion in postwar architectural writing. The structure of Japanese dictates a linguistic description of space different from that of European languages, as illustrated in the following combinations of ma with other characters. The toko-no-ma is at once a spatial and an aesthetic concept, and furthermore ahs an important social connotation in Japanese life. Classically it constitutes the unifying focus between host and guest, through an act of creation on the part of the host and an act of appreciation on the part of the guest. 虎の間 (tora-no-ma) The Tiger Room (literally, place of tigers) is the name of a room in the abbot’s quarters at Nanzenji in Kyoto. The dominant decorative motif on the sliding doors becomes the qualifier of the entire space, a common custom in mansions, castles, temples and present-day hotel ballrooms. The naming of places, manmade or natural, is a universal means of giving meaning and identity to a lived or existential space. 鏡の間 (kagami-no-ma) Dressing room (literally: mirror room) separated from the noh stage by a curtain. This is the place reserved for the magical transformation of the actor, via the donning of the spiritually-charged noh mask, and the meditation or inner-reflection involved in facing the full-length mirror. This is abstract time, with no indication of length, beginning or end. The ji character, which incorporates the radical for “sun,” is said to have denoted “forward movement of the sun” in ancient China. In Japanese the character is also pronounced toki, perhaps from the very old Japanese verb toku, to melt or dissolve. Thus “time” is expressed in Japanese as “space in flow,” making time a dimension of space. Indeed, time is essential to human experience of place. Here are a few modern Japanese phrases in which ma (sometimes pronounced kan) denotes stretches of time. 間男 (ma-otoko) Adulterer (literally: ma man) one who makes love in between usual places or usual times. The dual relation of ma to space and time is not simply semantic. It reflects the fact that all experience of space is a time-structured process, and all experience of time is a space-structured process. When we look at a traditional Japanese scroll picture or emaki-mono, time is concretely present as our eyes follow a sequence of spatial events interrupted by writing. Our hands actually unroll the scroll, that is, “move the space” as time passes. Nothing could be more detrimental to the intended narrative process of viewing than a full simultaneous display of the scroll as a whole. 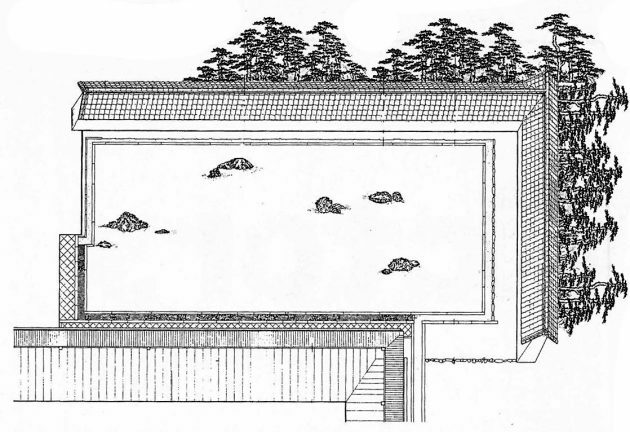 In traditional Japanese paintings of palaces and gardens shown in the fukinuke-yatai or “blown-away rooftop” technique, time becomes part of our spatial experience as our eyes have to move from scene to scene in various adjacent spaces. In traditional tourist manuals of famous scenic routes, which were sold as small books and could be unfolded into continuous strip pictures often more than 20 feet in length, an additional technique was used to represent space as a time-structured process. The spatial sights would be drawn above and below the continuous central road, shown as they would unfold themselves concretely over time to the actual traveller. Thus we end up with a “plan” of the route quite different from our modern orthographic maps. In a Tokaido manual of the mid-nineteenth century, for instance, Mt. Fuji is represented about 50 times in various settings along the route. We can find a similar presentation and understanding of space as a time and mood structured process in the layout of traditional Japanese stroll gardens and, on a smaller scale, a traditional Japanese stroll gardens and, on a smaller scale, in the placement of tobi-ishi, (“skipping stones”) used to make garden paths. By a sophisticated placing of the stones, our foot movements can be slowed down, sped up, halted or turned in various directions. And with our legs, our eyes are manipulated, and our visual input from spatial phenomena is structured over time. This shows us another side of the ma concept — the notion that animation is an essential feature of place. The animation may be something which is projected from one’s subjective feelings; but it also may be some external, objective quality, the genius loci or the spirit, which projects itself into our minds. Rene Dubos has alluded to this duality: “I remember the mood of places better than their precise features because places evoke for me life situations rather than geographical sites. The uses of ma point up the fact that the identity of a place is as much in the mind of the beholder as in its physical characteristics. Many waka and haiku poems begin with a phrase that employs ma to paint the atmosphere of energy of the setting. Ma ga warui or its opposite, ma ga umai, is often used an aesthetic judgment of Japanese calligraphy or sumi-e painting. Compared with Western painting, these Sino-Japanese art forms involve large unpainted areas. Anyone practicing calligraphy soon realizes that proficiency lies not merely in mastering the form of the characters, but also in the relationship of the form to the surrounding non-form. This balance of form and space will always be taken into account in the final artistic judgment. The proper appreciation of calligraphy also takes note of the dimension of time, for calligraphy is more than simple painting o drawing. It is an intricate mixture of poetry, dance and action painting. It is not only the placing of form into space, but also the marking of rhythm in time — the traces of the movement and speed of the brush. Noh is the supreme expression of the art of ma, combining all the aspects that have so far been elaborated here into one great symphony. It epitomizes the traditional Japanese artistic preoccupation with dynamic balance between object and space, action and inaction, sound and silence, movement and rest. 間取り (ma-dori) Design (literally: grasp of place. The Japanese architect traditional worked to “create a sense of place” (ma-dori o tsukuru). Implicit in this term, according to architect Seike Kyoshi, was the design not only of structural elements in space, but also of the variable arrangements for temporary uses which are so characteristic of the Japanese dwelling. By adding and removing sliding doors, windows, portable screens and other household utensils, the Japanese home is adapted to changing seasons, uses and social needs. Nowadays, unfortunately, the term ma-dori, so charged with connotations of place, has been replaced with an “exotic” imported term: dizain (design). Japanese collective conditioning is very well developed. The importance of sense of place to this mindset is revealed in some of the phrases used to describe cases of deficiency. Two related conclusions seems to offer themselves. First, that people are thought to exist only in the context of “place.” Manking was seen as only one component in a bigger whole of man/environment/nature. The implication is that the greater the whole, rather than human beings by themselves, is the measure of all things. This is reinforced by Buddhist philosophy. In contrast, the Western mind has tended to envisage the human being as a perfect and self-contained individuum (that is, indivisible whole) who should be educated to distinguish oneself from everyone else. We are encouraged to view the self as real, to discipline I and to express highly individual values. The desire to produce individual genius, a “superman,” has haunted all of Western history. The adoption of tae-ma in these poems is an allusions to the Buddhist experience of ku (空), of the void or emptiness; the first uses a spatial metaphor, the second a temporal one. They are expressions not only a poet, but of a mediator too. With the discussion of the void we have left the scope of phenomenology, architectural or otherwise. The “void” in the Buddhist sense is not a concept arrived at by rational thought, but an expression of an incommunicable individual experience, accessible only to a person practicing meditation. Here, o Sariputra, form is emptiness and the very emptiness is form; emptiness does not differ from form, form does not differ from emptiness. This world view offered by Buddhism only makes sense if one appreciates the first word of the sutra, the word “here.” “Here” means “in my state of being,” that is, enlightenment. Thus, for the normal human being the sutra cannot make sense; it will stay utterly paradoxical. Ultimately, nothing can be stated about the “void.” It is impossible even to think about it. Nevertheless, enlightened ones, each in their own way, have created many devices with which they have tried to lure their disciples into a state of being in which the above phrase does make sense. Buddha used words and what he said has been transmitted to us in the sutras. Chinese and Japanese enlightened masters who have followed his path have used poetry, painting and gardening to communicate their messages. One of the most famous examples, and for me an effective one, is the rock-garden at Ryoanji, the “Peaceful Dragon Temple” in Kyoto. We do not know who created the garden, nor when it was created in its present form. It is a karesansui (dry landscape garden), to be appreciated from a fixed vantage point, on the verandah of the temple. My suspicion is that the origin of the garden lies in meditation techniques using staring. For here, the object — the natural rocks — is aesthetically so perfectly arranged in space — the finely raked white sand surface — that eventually the onlooker ceases to be aware of either the one or the other separately. The flow of energy is reversed and one is thrown onto the experience per se — consciousness. This “experience” — the word has to be used in quotation marks now — of consciousness is the “experience” of the “void,” of “no-thingness,” of “emptiness.” It is therefore not a philosophical or aesthetic concept, but a notion derived from personal experience, a notion both beside and beyond the personal experience, a notion both beside and beyond the experience of our physical world. It does not deny it. It is based on the reversal of the usual flow of our energy. I dived down into the depth of the ocean of forms, hoping to gain the perfect pearl of the formless. This essay is based on a talk given at Cornell University in June 1976 at the Topical Seminar on Time and Space in Japanese Culture, sponsored by the Joint Committee on Japanese Studies. I am indebted to Wendy Cowles for her editorial assistance. Readers for whom this analysis of ma seems too demystifying should search out the beautifully illustrated catalogue of Isozaki Arata’s 1976 exhibition, “Ma: Space/Time in Japan,” at the Cooper-Hewitt Museum, New York. Norberg-Schulz, Christian. Genius Loci — Towards a Phenomenology of Architecture, Rizzoli, New York 1980. Ralph, Edward, Place and Placelessness, Pion Ltd, London, 1976. LaFleur, William R. “Notes on Watsujii Tetsuro’s Social Philosophy and the Arts: Ma in Man, Time and Space,” unpublished paper, Topical Seminar on Time and Space in Japanese Culture, Cornell University, 1976. 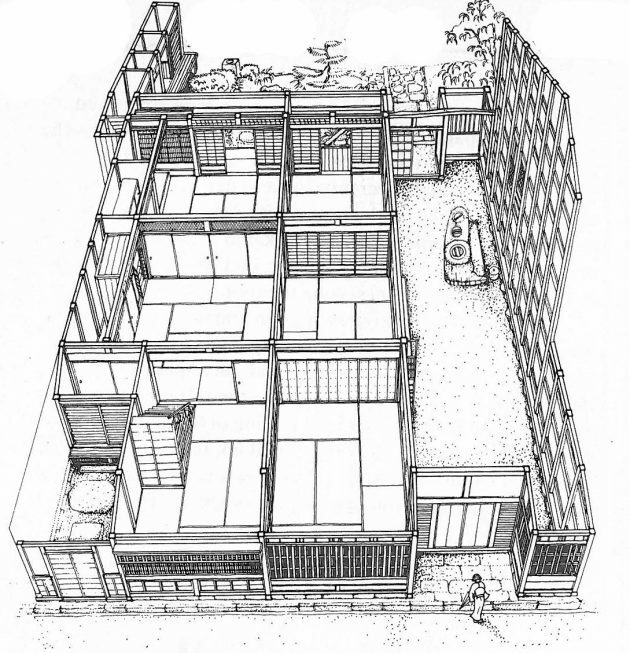 For a detailed study of the relationship between a room size and its social use over history, see Kojiro Junichiro, “Kokono-ma ron” (The Nine-mat Room), in SD: Space Design, Tokyo, June 1969. Ono Suzumu, Nihongo o sukanoboru (Tracing the Origins of the Japanese Language), Chapter 2, Iwanami Shinsho, Tokyo, 1972. Dubos, Rene. A God Within, Scribner’s, New York, 1972. Komparu Junio, The Noh Theatre: Principles and Perspectives, Weatherhill/Tankosha, Tokyo 1983. 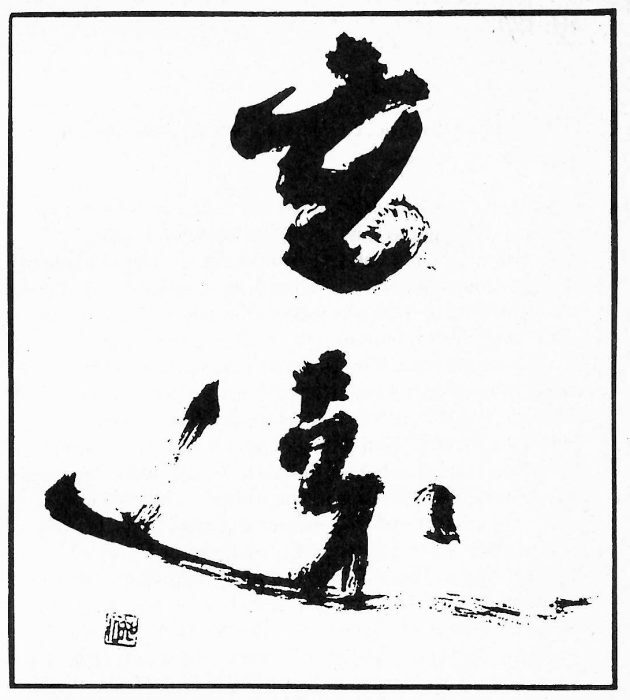 Seike Kyoshi, “Sumai to ma,” in Nihonjin to ma, Kenmochi Takehiko, ed., Kodansha, Tokyo 1981. LaFleur, William, “Saigyo and the Buddhist Value of Nature,” Part II, History of Religions, Feb. 1974. The translations are my own. Rajneesh, Bhagwan Shree, The Heart Sutra, Rajneesh Foundation, Poona 1977. Tagore, Rabindranath, Poem 100, Gitanjali, London 1914.